Free batch convert Word, PowerPoint, JPEG, JPG, WMF to PDF converter. With it, you can view your document, image more vividly with a PDF viewer. It supports massive formats including doc,docx,docm,ppt,pptx,pptm,jpeg,jpg,wmf etc. Tiff PowerPoint Word to Pdf Converter 3000 is a small, fast and efficient converter. It is designed to free batch convert Word, PowerPoint, TIFF to PDF without losing any original quality. An easy-to-use and flexible converter which is designed to free batch convert Word, Excel, PowerPoint to PDF with preserving the original text, graphics, images, layout etc. It supports various formats as doc, xls, ppt etc. 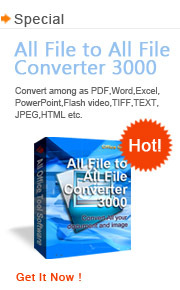 Doc/Docx to Pdf Converter 3000 is an easy-to-use and fast PDF converter. It can free batch convert Word doc, docx format files to PDF with brilliant results and without any problem. Ppt/Pptx to Pdf Converter 3000 is a powerful PDF converter which can free batch convert ppt, pptx format files to PDF with accurately retaining the layout of the original document file. More, the conversion speed is very fast. Jpeg to Pdf Converter 3000 can help you free batch convert JPEG, JPG to PDF with accurately preserving the layout of original image files. It is one small converter that can instantly convert JPEG images into PDF files with fast speed. Html to Pdf Converter 3000 is a powerful and easy-to-use converter that is designed to free convert HTML file to PDF document. Just specify a html/htm, it will directly convert it to a PDF document with professional quality and fast processing speed. Word Excel PowerPoint To Text Converter 3000 is an easy-to-use and flexible converter which is designed to free batch convert doc, docx, docm, xls, xlsm, xlsx, ppt, pptx, pptm, rtf, txt etc to TEXT with preserving the original text etc.